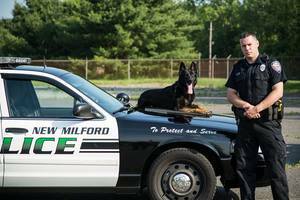 On January 26 at approximately 1:56 AM, New Milford Police Officer Mike Lafond and Police K-9 Kira were called to assist the Danbury Police Department in locating a male party who had threatened suicide and fled a residence on foot. The man was outside in -15 degree weather. K-9 Kira tracked for more than an hour and was able to locate the unresponsive subject in a wooded area. Officer Lafond administered two doses of Narcan. The man was transported to the hospital for treatment where he was able to recover. New Milford Police Chief Cerruto said, "This is an example of the excellent police work our K-9 teams perform on a continual basis, I want to commend Officer LaFond and his K9 partner, Kira for their quick and determined action to locate and provide the necessary medical assistance. If the person was not located the outcome could have been tragic".